I think Children of Time may be the best book I’ve read this year so far. At the very least, it’s the sci-fi book I’ve enjoyed the most in quite some time. If you like far-future sci-fi and you’re looking for a good read, I’d recommend that you take the plunge without reading further. But I’m going to say a few things that are revealed very early in the book that might entice you if you’re not convinced. I don’t think I’ve ever seen a sci-fi book build a civilization like Adrian Tchaikovsky does here. He starts at the beginning and works into what we would perceive to be the future…but he does it with a non-human, non-alien sentient creature, so their civilization looks nothing like ours and yet is completely believable. It is absolutely fascinating–I couldn’t take my eyes off the page for the many chapters about this civilization. 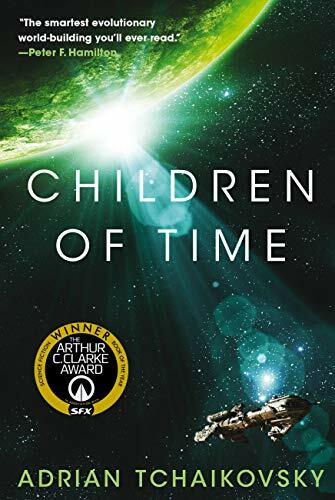 Children of Time may not be the first book to use this method, but it uses it so well: Basically, while the civilization is forming, you also follow some humans on a spaceship, but most of them are locked in stasis as the ship travels across time and space. Because of this, we get to follow the same characters throughout the book–it’s very character driven. And you can really feel/see through their eyes what it means to have such huge amounts of time–hundreds, even thousands of years–pass while they’re in stasis. I loved this book. Really, really loved it. If you read it, please tell me what you think–I’d love to hear your thoughts. And if not, what’s the last great book you read? This entry was posted on Monday, October 8th, 2018 at 9:15 pm	and is filed under books and tagged with books. You can follow any responses to this entry through the RSS 2.0 feed. I was considering this for my next audiobook. It’s got fantastic reviews on Audible, and one of the highest average ratings I’ve ever seen. But then I read a review mentioning the spiders and now I’m a little unsure….anything but spiders! I would bet that you will end up loving the spiders. I don’t like spiders either, but there’s something really wonderful about them in this book. Sounds like something a spider would say. They’re already taking over, aren’t they?!? Sounds interesting, I’ll give it a whirl on Audible. One book you may want to check out, both as a good far-future sci fi but, more importantly, as a meditation on why we play board games, is Iain Banks’ “The Player of Games.” It’s a very interesting and thoughtful piece on what it means to “win” at a game and how we motivate ourselves while playing. A bit slow at first, but I loved it. Thanks! Thanks for the suggestion. I will add it to my list. Thanks Vincent. I’ve read the first book. The author lives in St. Louis (where I live)! I’m currently reading Accelerando by Charles Stross. And I have to admit, it is a bit much for me. I can’t quite grasp everything and feel dumb. But I like the general theme so I’m still reading it. Have you ever finish a book and had the feeling you didn’t understand a big part of it? I’ve definitely had that feeling of not understanding or not knowing what’s going on…and I generally don’t like it. In my opinion, there’s a difference between a book not explaining everything until the right time (like Hyperion) or explaining complex concepts in relatable ways (like Seveneves and The Martian) versus an author who doesn’t try to help the reader keep up with them.